Fifty years ago, Madeleine L'Engle introduced the world to A Wrinkle in Time and the wonderful and unforgettable characters Meg and Charles Wallace Murry, and their friend Calvin O'Keefe. When the children learn that Mr. Murry has been captured by the Dark Thing, they time travel to Camazotz, where they must face the leader IT in the ultimate battle between good and evil—a journey that threatens their lives and our universe. 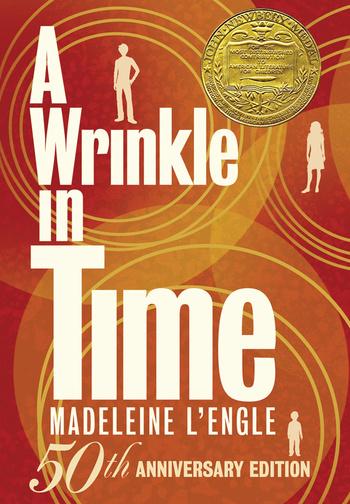 A Newbery Award winner, A Wrinkle in Time is an iconic novel that continues to inspire millions of fans around the world. This special edition has been redesigned and includes an introduction by Katherine Paterson, an afterword by Madeleine L'Engle's granddaughter Charlotte Jones Voiklis that includes photographs and memorabilia, the author's Newbery Medal acceptance speech, and other bonus materials. It's time for a new generation to share the adventure! Celebrate the 50th Anniversary of A Wrinkle in Time!